As a follow up to the ARCHOS 7 and ARCHOS 8 Home Tablets, ARCHOS has launch five new Android tablets. 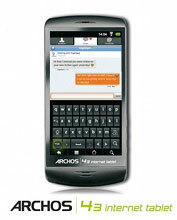 The Internet tablets as they are called, consist of the: wide screen ARCHOS 70 and 100, multi media ARCHOS 43, and the ultra portable ARCHOS 28 and 32. The new range offers a combination of PC like web-browsing, social networking, games, eBooks and other apps alongside HD video and music in a very slim-line design. 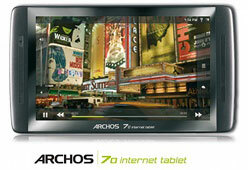 Depending on what you are looking for in a tablet the ARCHOS internet tablets varies in functions and sizes. 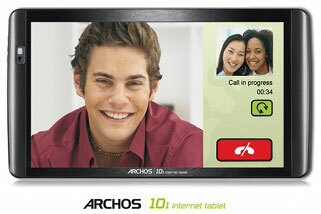 There are the ARCHOS 70 and 100 for instance which offer webcam and there are sizes from 4.3 inch to 10.1 inch. The ARCHOS has a camcorder for video and photo functionality. According to ARCHOS they have specifically developed four Android applications for music, video and photo and to enhance the users experience they have added 3D cover animation. The tablets are ideal portable multimedia players, with up to 720p HD video playback as standard. With HMDI TV output port you can connect them to your HDTV to stream your images to the television, also they can be a game pad for your TV and with built in 3D open GL technology you should not have any problem with speed or quality.